This Sailing Into the Sunset Watercolor shows off the natural beauty of the East Coast in a simple, vibrant way. This digital watercolor is based off of a picture taken of the National Harbor in Maryland and features a single boat sailing on the Potomac River. This fully colorized watercolor is available on canvas or lightweight, durable metal. Both mediums are available in different sizes, from 11 by 14 inches to 24 by 32 inches (canvas) and 24 by 36 inches (metal). For bulk orders, custom sizes and materials are available. •	Superb color clarity & quality. •	.045" thick HD metal panels. •	Can be used indoors, outdoors and in moisture rich environments. •	Indoor use offers best color lifespan. •	Metal print is easy to clean with a microfiber cloth. Use windex or water. •	Easy to mount hanging hardware on the back! •	Metal and Canvas prints shipped within 3-5 business days. This Sailing Into the Sunset Watercolor shows off the natural beauty of the East Coast in a simple, vibrant way. This digital watercolor is based off of a picture taken of the National Harbor in Maryland and features a single boat sailing on the Potomac River. This fully colorized watercolor is available on canvas or lightweight, durable metal. Both mediums are available in different sizes, from 11 by 14 inches to 24 by 32 inches (canvas) and 24 by 36 inches (metal). For bulk orders, custom sizes and materials are available. This beautiful wall decor item is the perfect addition to a guest room, office, or any place that needs a touch of serenity. As a metal print, this photography art will remain water, scratch, and fade resistant, even if hung in direct sunlight. Metal prints are perfect for people who move around a lot and need portable, durable goods, or those who have young children and want to avoid glass items. This home decor is a thoughtful housewarming gift to someone who is just starting to feather their nest! Features • Materials: Metal, canvas • Metal Print: 11”x14”, 16”x20”, 24”36” • Canvas Print: 11”x14”, 16”x20”, 24”x32” • Custom sizes and materials available for bulk orders • Superb color clarity & quality. • .045 thick HD metal panels. • Can be used indoors, outdoors and in moisture rich environments. • Indoor use offers best color lifespan. • Metal print is easy to clean with microfiber cloth. Use windex or water. • Easy to mount hanging hardware on the back! • Metal and Canvas prints shipped within 3-5 business days. For more information or if you have questions, please contact us, we are happy to help! Thank you so much for looking at this Sailing Into the Sunset Watercolor. This Fall Colors Print captures the magic of autumn. 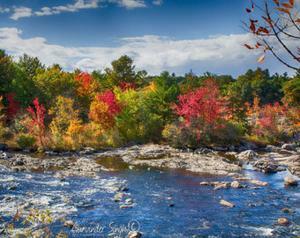 This print shows beautiful changing fall leaves and a river in southern New Hampshire. Sharp and vibrant, this print is available in either metal or canvas. For both mediums, you can choose multiple sizes, or customize it with your own measurements for bulk orders. This full-color wall decor shows a panoramic tableau, and is perfect as a focal point for a room. This picture is a perfect gift for a New Hampshire native who wants to be reminded of the natural beauty of their own state. It’s also a thoughtful housewarming present for anyone who loves rivers or who looks forward to autumn. This gorgeous nature photograph is an eye-catching and calming addition to a den, bedroom, or guest room. When hung over a mantel, this nature tableau exudes the cozy accents of fall all year round! Features • Materials: Metal, canvas • Metal Print: 11”x14”, 16”x20”, 24”36” • Canvas Print: 11”x14”, 16”x20”, 24”x32” • Custom sizes and materials available for bulk orders • Superb color clarity & quality. • .045 thick HD metal panels. • Can be used indoors, outdoors and in moisture rich environments. • Indoor use offers best color lifespan. • Metal print is easy to clean with microfiber cloth. Use windex or water. • Easy to mount hanging hardware on the back! • Metal and Canvas prints shipped within 3-5 business days. For more information or if you have questions, please contact us, we are happy to help! Thank you so much for looking at this Fall Colors Print. This Niagara Falls Black and White Print is a perfect addition to a den or study. This serene black and white image of the Niagara Falls is available as a metal or canvas panel. Taken by an independent nature photographer, this picture of the Niagara Falls in upstate New York captures the majesty of nature juxtaposed against a modern skyline. 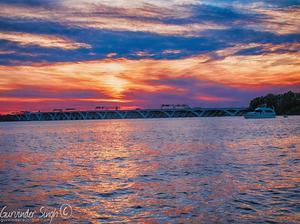 This print is available in numerous sizes and can be customized, depending on where you plan to hang it. This sharp black and white photography decor item will look great in a work or office setting, or in a relaxing room of your home. It’s available on canvas or metal, depending on your preferences. Canvas conveys a sense of classic tastes, while metal is lightweight, durable and modern. However and wherever you decide to hang this print, it’s sure to become a focal point of any room! Features • Materials: Metal, canvas • Metal Print: 11”x14”, 16”x20”, 24”36” • Canvas Print: 11”x14”, 16”x20”, 24”x32” • Custom sizes and materials available for bulk orders • .045 thick HD metal panels. • Can be used indoors, outdoors and in moisture rich environments. • Indoor use offers best color lifespan. • Metal print is easy to clean with microfiber cloth. Use windex or water. • Easy to mount hanging hardware on the back! • Metal and Canvas prints shipped within 3-5 business days. For more information or if you have questions, please contact us, we are happy to help! 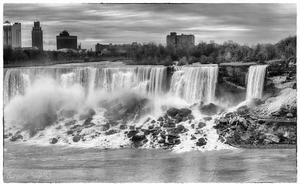 Thank you so much for looking at this Niagara Falls Black and White Print. These Four Seasons Print panels will bring mother nature into your home. Taken over the course of two years, this handmade set of wall decor consists of four vibrant panels showing a maple tree as it progresses through the seasons. These stunning images of a West Virginia maple are printed on metal, which is fade and scratch resistant and is more lightweight than framed canvas. These metal frames are available in three different sizes, depending on your interior design needs. The simple message of this nature photo set will resonate in any home. These convenient metal prints will look beautiful in any room of your house, be it your kitchen, bedroom, bathroom, or den. Durable and three-dimensional, these photos don’t require a frame. This four seasons photo set makes a great housewarming present for a new couple who is just building their home together, or a birthday gift for a nature lover. Features • Materials: Metal • Dimensions: 4 - 10”x10” panels; 4 - 20”x20” panels; 4 - 30”x30” panels *** NOTE SIZES ARE FOR EACH PIECE OF THE PANEL • Superb color clarity & quality. • .045 thick HD metal panels. • Can be used indoors, outdoors and in moisture rich environments. • Indoor use offers best color lifespan. • Easy to clean with microfiber cloth. Use windex or water. • Easy to mount hanging hardware on the back! • Custom sizes and materials available for bulk orders • Metal prints shipped within 3-5 business days. For more information or if you have questions, please contact us, we are happy to help! Thank you so much for looking at this Four Seasons Print. This Fall Colors on a Maple Tree Print brings the aura of autumn into your home. 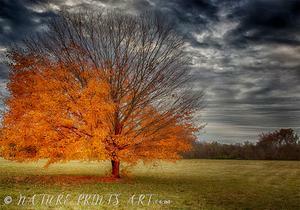 This color photograph taken in Charles Town, West Virginia shows a maple tree on the cusp of autumn and winter. Its brilliant orange leaves are highlighted against pale green grass and a dark, cloudy sky. This nature photograph is available as a metal print, and is also part of a four-panel season set. This nature print makes an eye-catching focal point or accent in any room. Its simple and yet striking way of conveying the power of the seasons will add a sense of calm to your home office, workplace, bathroom, guest room, or den. As a metal print, this wall decor item is lightweight, durable, and fade-resistant. It’s a great gift for someone who moves or rearranges frequently. As part of a full set, this stunning photograph can hang over a mantle as the focal point of a room. Features • Materials: Metal, Paper • Paper print sizes available (select above the add to cart button): 4 x 6, 5 x 7, 11 x 14, 16 x 20, 24 x 36 • Paper prints shipped within 2-3 business days. • Custom sizes and materials available for bulk orders Metal Prints • Metal Print sizes: 11”x14”, 16”x20”, 24”x36” • Superb color clarity & quality. • .045 thick HD metal panels. • Can be used indoors, outdoors and in moisture rich environments. • Indoor use offers best color lifespan. • Easy to clean with microfiber cloth. Use windex or water. • Easy to mount hanging hardware on the back! • Custom sizes and materials available for bulk orders • Metal prints shipped within 3-5 business days. • Available separately or as part of a set. https://www.etsy.com/listing/455409888/four-seasons-of-maple-tree For more information or if you have questions, please contact us, we are happy to help! Thank you so much for looking at this Fall Colors on a Maple Tree Print. Never be far from the calming powers of nature with this Little Barn on a Prairie Print. 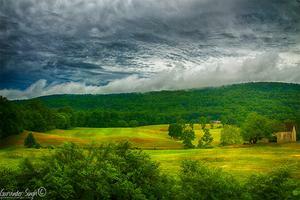 This photograph of an idyllic mountainside farm features rolling green hills against a stormy dark blue sky. The vibrant colors of this tableau picture speak to the majesty of the Appalachian mountains and the people who farm them. This wall decor is available as a canvas or metal print, and comes in various sizes, from 11 x 14 inches to 24 x 32 inches. This nature photography print is a perfect addition the home of someone who loves the Appalachian mountains or Appalachian culture. When printed on metal, this picture becomes shatter resistant and fade resistant and is very lightweight, so it’s a great gift for someone who is moving but wants to take a piece of the mountains with them. Features • Materials: Metal, Paper, Canvas Paper Prints • Paper print sizes available (select above the add to cart button): 4 x 6, 5 x 7, 11 x 14, 16 x 20, 24 x 36 • Paper prints shipped within 2-3 business days. • Custom sizes and materials available for bulk orders Metal and Canvas Prints • Metal and Canvas print sizes: 11”x14”, 16”x20”, 24”x36” • Superb color clarity & quality. • .045 thick HD metal panels. • Metal prints can be used indoors, outdoors and in moisture rich environments. • Indoor use offers best color lifespan. • Metal prints easy to clean with microfiber cloth. Use windex or water. • Custom sizes and materials available for bulk orders • Metal and Canvas prints shipped within 3-5 business days. • Easy to mount hanging hardware on the back! For more information or if you have questions, please contact us, we are happy to help! Thank you so much for looking at this Little Barn on a Prairie Print. 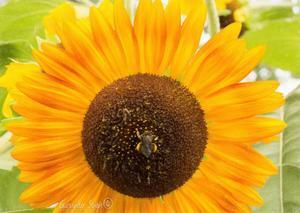 Add a pop of color to your walls with this Sunflower With Bee print! Vibrant and detailed, this nature print displays the simple and yet beautiful workings of Mother Earth. Hang it in your living room, office, den, or nursery and allow this close-up flower print to bring happiness to your living space. With its bright, simple colors, it also provides a focal point for a wall collage! Depending on your needs or your existing interior design, this flower graphic comes as a canvas or metal print. Taken in West Virginia, this wildflower wall art is a gentle reminder of the simple effectiveness and symbiosis of nature. Hang it on your wall or a loved one’s wall as a reminder that the world is a beautiful place! Features • Materials: Metal, canvas • Metal Print: 11”x14”, 16”x20”, 24”36” • Canvas Print: 11”x14”, 16”x20”, 24”x32” • Custom sizes and materials available for bulk orders • Superb color clarity & quality. • .045 thick HD metal panels. • Can be used indoors, outdoors and in moisture rich environments. • Indoor use offers best color lifespan. • Metal print is easy to clean with microfiber cloth. Use windex or water. • Easy to mount hanging hardware on the back! For more information or if you have questions, please contact us, we are happy to help! Thank you so much for looking at Sunflower with Bee.